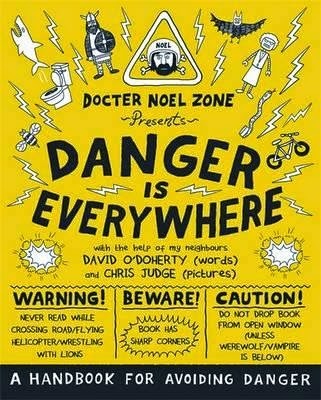 Docter Noel Zone is going to take your kids on a ride. A very safe ride, tucked in with a safety belt, knee pads and helmet. At a very low speed. You see, Docter Zone thinks the world is a verrrrry dangerous place, and we need to be on full alert at all times, lest we want to end up in serious trouble. Or even dead. Before even opening the book, Docter Zone advises against reading this book while crossing the road or flying a helicopter, but most especially not when wrestling lions. Inside, we are given further instruction on how to use the book, including safe places to read (eg: in bed, having first checked underneath the bed for sleeping tigers), and the fact that the book simply MUST be checked for scorpions before anyone can relax. There are also many very important acronyms thrown around, especially the ultra-vital SPLOD, which stands for Special Protocol Language of Dangerology, and simply must be studied before embarking on any kind of--er--anything, really. Because danger is everywhere! And don't you forget it. This fabulously fun book is packed with illustrations and typography that will engage even the most reluctant reader. Brilliantly dry humour and over-the-top drama will mean lots of book-sharing, too. Throw in some farting, bee-stinging and evil laughter, and you have a great recipe for some serious book engagement, meaning the only real danger here is not having a follow-up tome.